Half that blessing thou‘lt give me. The reference is to Mothering Sunday, which is traditionally the fourth Sunday in Lent, also known as Mid-Lent Sunday, and for Herrick to refer to it in this way shows that the custom of making simnel cakes was well established in the early 17th century. 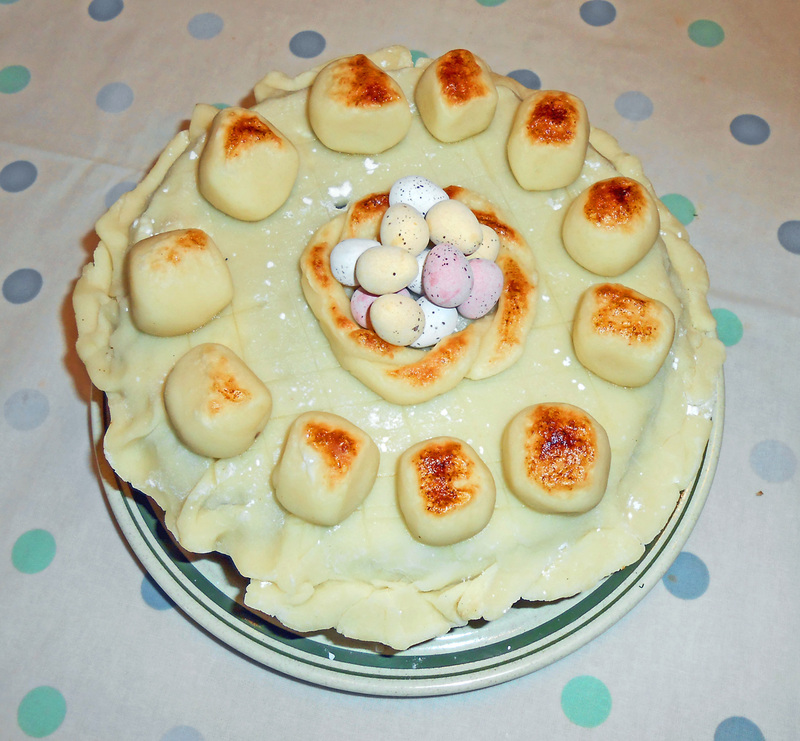 Whatever the theoretical origins, in many areas one custom prevailed: children, often working away from home as apprentices or servants, visited their parents on Mothering Sunday, while children at home or away would give a simnel cake to their mothers. Gradually the custom concerning simnel cake changed, becoming more of a secular seasonal treat like Christmas cake. On 10th March 1803, William Holland, the vicar of Over Stowey in Somerset, received a parcel addressed to his daughter Margaret: ‘a fine Cymnel [simnel] cake with a box of the well known Shrewsbury cakes either from Mrs or Miss Kinaston [his relatives at Ruyton near Shrewsbury in Shropshire] … after dinner Margaret carried a large piece of Cymnel and some cakes to [their friends] the Miss Pooles.’ The following year, Holland received another simnel cake which he thought was ‘peculiar to the Town of Shrewsbury: large and deep, a thick crust with saffron in it and hard, and filled the inside with sweetmeat.’ This type of cake was a speciality of Shropshire, and there were several other regional recipes. Most were variations of a rich fruit cake that had plenty of marzipan in the mix and on top of the cake. Some cakes had eleven balls of marzipan on top, said to represent eleven apostles of Jesus, excluding the twelfth – Judas. In 1907 Anna Jarvis, who was a schoolteacher in Philadelphia, USA, suggested a special Mother’s Day. After successful lobbying of Congress, it was officially recognised in 1913 and was set as the second Sunday in May, breaking the connection with Lent and Easter. In Britain and Ireland, the old Mothering Sunday was retained, but after the Second World War it evolved into an American-style Mother’s Day, aided by the efforts of commercial interests keen to sell more cards and gifts. At the same time, simnel cakes have also gained popularity as a seasonal speciality, being sold by supermarkets and shops, as well as being created at home. This entry was posted on June 29, 2017 by adkins.